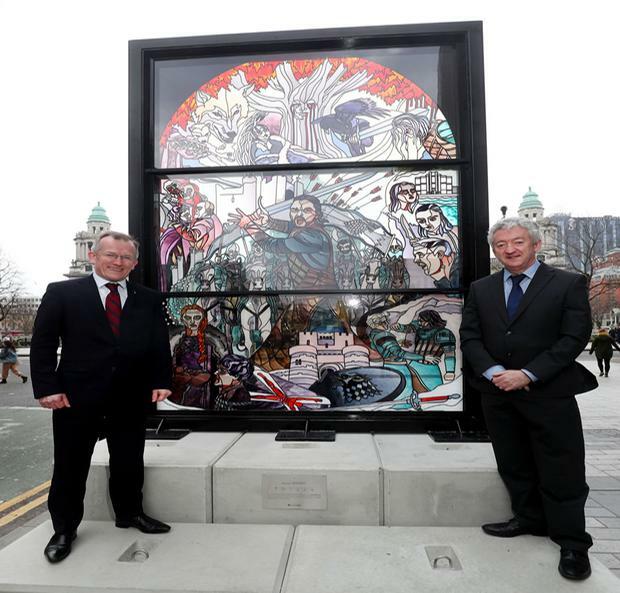 The window, set on a plinth opposite City Hall, is the first of six such installations designed to showcase Northern Ireland as 'Game of Thrones Territory'. Some 70pc of the HBO smash hit, which this week began its eighth and final series, is produced in the region - both in studios and on location. The ‘Glass of Thrones’ promotional campaign will see a new window unveiled for each of six episodes in Season 8. Each window will highlight a key House from the show, as well as "the most exciting and talked-about moments" from the saga. “We’re taking Northern Ireland’s cultural and industrial heritage in stained glass and glass production and bringing it full circle – to celebrate Northern Ireland’s newest and biggest cultural export," said Niall Gibbons, CEO of Tourism Ireland. Promotional efforts in Northern Ireland have ranged from Game of Thrones passports to a giant, handmade tapestry, 'Doors of Thrones' carved from fallen storm trees at the iconic Dark Hedges, and even three-eyed ravens at City Hall. A Game of Thrones app highlights more than two dozen locations accessible to fans, and a host of themed activities have cropped up - from archery lessons at Winterfell (Castle Ward) to afternoon tea with 'Dothraki trifle' at Ballygally Castle. “Game of Thrones has been transformative for tourism in Northern Ireland," said John McGrillen, CEO of Tourism NI. "For ten years, Northern Ireland’s spectacular landscapes, dramatic coastlines, foreboding mountains and ageless forests have formed the perfect backdrop for its fantasy world, making Game of Thrones now truly part of our culture." Pól Ó Conghaile Celebrity Cruises has called Dublin Port's decision to limit cruise ship visits "very disappointing" and asked it to reconsider the move.